February 2016 | Can I Still Drink Wine? I'm someone who likes to be prepared. So before I started chemotherapy I searched high and low for a list of things that I needed to have in the house, whether it be biscuits or fluffy socks, for when I started chemo. 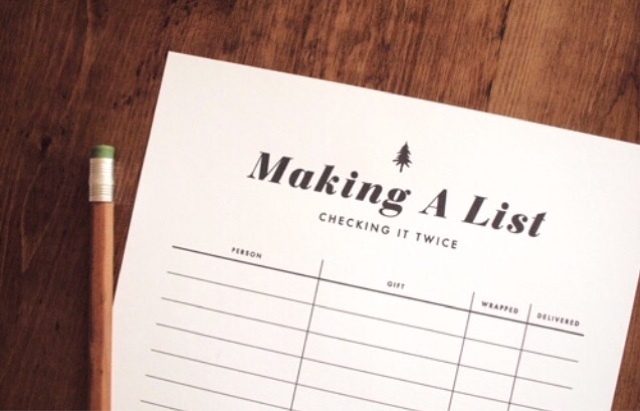 So here's my ultimate pre-chemo shopping list. Get yourselves to Asda. I had 6 rounds of chemotherapy. 3 EC followed by 3 Docetaxel. 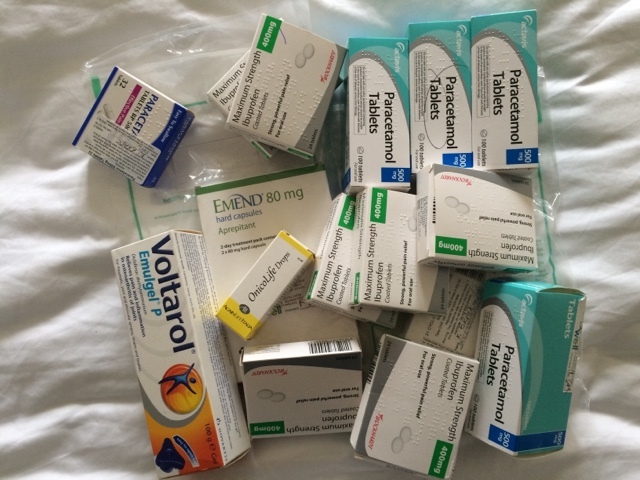 Both chemotherapy treatments are very different so I'll mark on the list whether the item is for EC chemo (EC), Docetaxel (T) or needed for both (B). 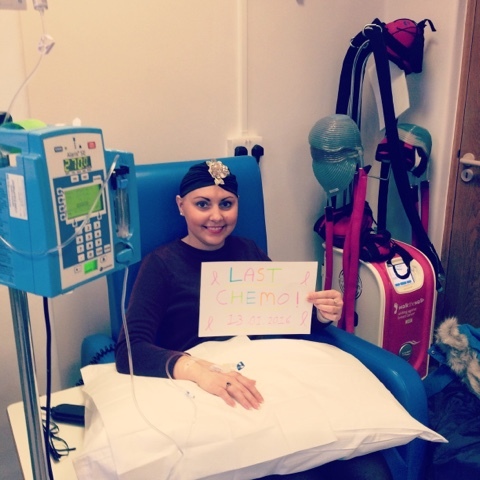 Obviously everyone reacts differently to chemo but, hopefully, you will find the below list useful if you are about to undergo chemotherapy treatment. - Try and get your wig (if you are going to get one) before your second cycle of chemo as you are likely to have lost your hair before then if you are having EC chemo. 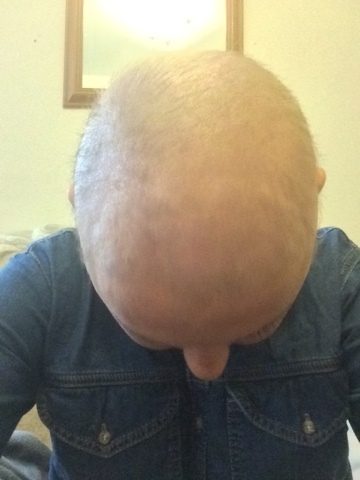 I went for my wig fitting a few days after my first chemo cycle, and although I wanted to throw up for most of the appointment, I was glad I got it sorted. If you are reading this list because you are preparing to start chemotherapy then you are probably scared shitless (I know I was). But trust me when I say that chemotherapy is very manageable. No it's not going to be nice in fact at times you are going to feel pretty rubbish but it is manageable and it will be over before you know it. I've realised I haven't really posted much about hair loss since mine decided to piss off and leave me. So, just to give you all an update, for the past couple of months I have officially looked like a cancer patient. 'Hellooooo...from the other side! No this is not the time to quote Adele lyrics. (I swear all these drugs are making me nuts). Gone is the Jesse J, Sinead O'Connor, Demi Moore and Britney 2007 look. I don't feel like a strong, empowered, independent woman anymore who has stood up to cancer and shaved off all her hair to take back some control. I feel and look like I have cancer. 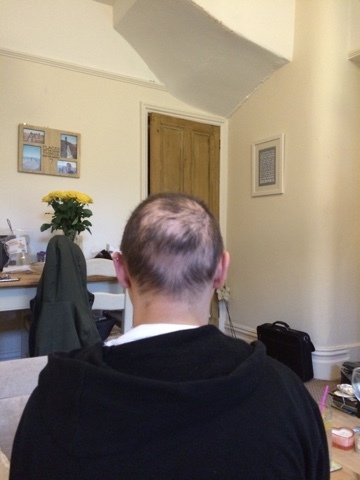 Losing your hair is pretty much like getting your bus pass when you're a pensioner in 'cancer world'. You are officially a member of the club. The cancer club. 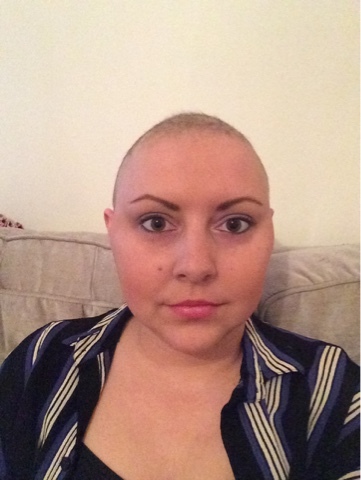 I shaved my hair off on 10th October. 12 days after my first chemo. My hair decided to start falling out 17 days after my first chemo. 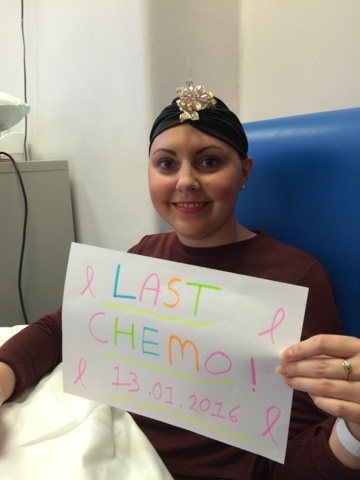 4 days before my second chemo cycle. So I guess I did the shave just in time. I'm really glad I decided to shave my hair off before it decided to bugger off on its own accord. It was upsetting to see it come out in the bath and I could pull chunks out with my hand. But it was short hair I found in the bath and on my pillow and in my hands and I think it would have been so much more heartbreaking if this had been my long hair. 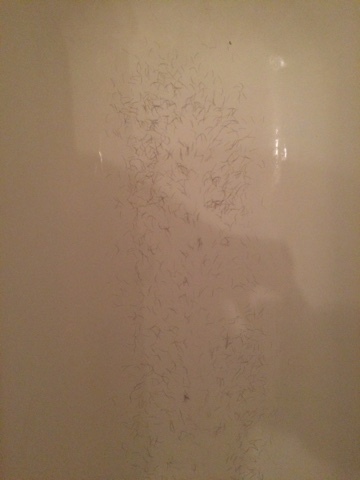 The below picture shows the hair left in the bath a day later on 16th October. 18 days after my first round of chemotherapy. There's quite a bit of difference between the two pictures above even though the second picture is just a day later. However, I don't think my hair fell out as fast as I thought it would. I thought there would be big clumps falling out at a time. Of course it could just look less because the hair is very short as I shaved it off. The picture below is the one that I sent my mum on Whatsapp prior to her visit so she knew what to expect when she came to see me. This was taken on the 18th October. So I've been bald for a couple of months now. Although obviously I'd love to have my own hair back I've kind of got used to being a baldie. When my hair grows back it's going to feel weird. I haven't ventured outside baring my my bald head since I lost my hair. Mostly because I think people will stare. Not necessarily in a mean way but in a 'I know you are really ill' kind of way. So I mostly stick to my wigs outdoors or I sometimes wear a turban if my wigs are causing me too much grief (they can sometimes be hot and itchy - especially now I'm menopausal). A few people have asked me why I didn't cold cap. Cold capping works by reducing the amount of chemotherapy drugs that reach the hair follicles therefore hopefully reducing hair loss caused by the drugs. The cold cap was offered to me at my hospital but I decided not to go ahead with it. (Excuse the pun) There's a few reasons why I chose not to cold cap. Firstly my BCN told me it rarely works. 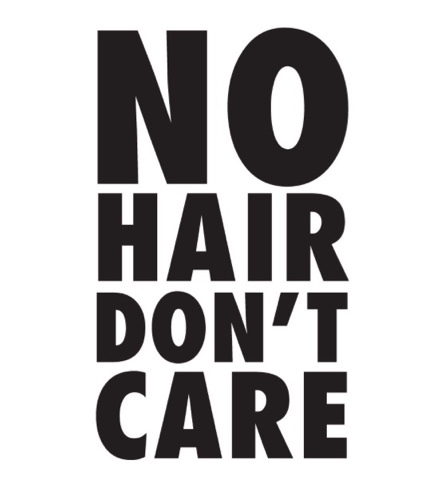 Even if it does work you are often left with bald patches and very thin hair. My hair was thin anyway and not in the best condition so I just didn't see the point of giving the cold cap a go. The procedure involves freezing your head, which is obviously quite a painful process. Patients are often given painkillers to cope with the pain. The procedure also prolongs your total chemotherapy time. 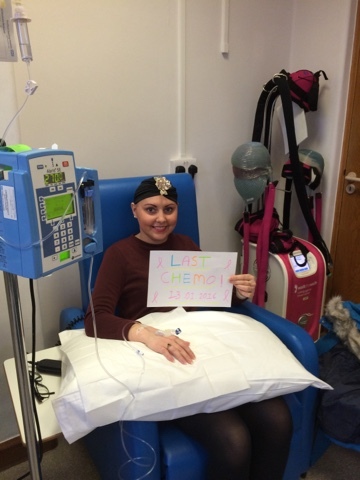 I thought chemotherapy was bad enough without being there for longer, in more pain and having to take more drugs. Finally, I don't like the idea that cold capping stops the chemotherapy drugs reaching the hair follicles. To be honest this was the main reason I didn't even consider giving cold capping a go. I had chemotherapy as a preventative measure. They think they got all the cancer during my surgery and the chemotherapy treatment is just to make sure there are no stray cells knocking about my body and the cancer doesn't come back. The thought that the cold cap prevents the chemotherapy drugs reaching my hair just doesn't sit right with me. I know...I know...Doctors wouldn't lets us do it if they thought it was dangerous but the process just bothers me. I didn't go through chemotherapy for the fun of it. I want the chemotherapy drugs to reach every single inch of my body and I wouldn't have it any other way. Take my hair if you want. I don't care. 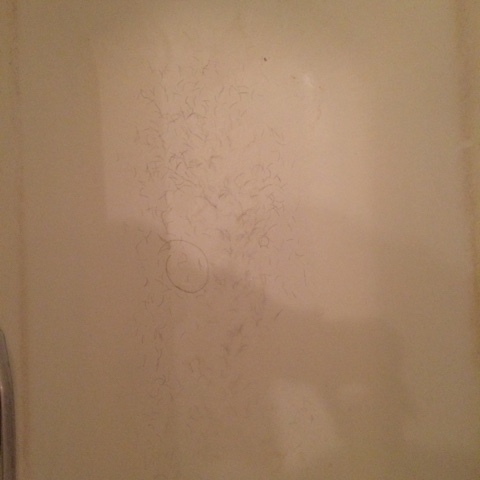 The hair on my body stopped growing as soon as the hair on my head fell out. Although my eyebrows and eyelashes decided to stick around for a bit, which was nice of them. 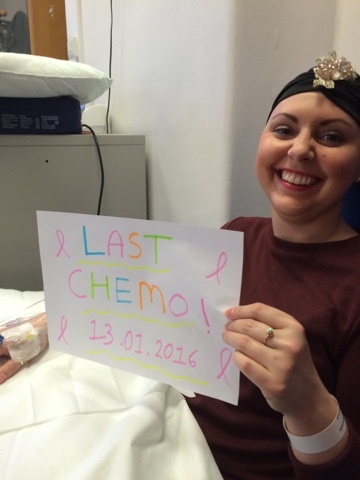 They decided to wait until my fifth chemo and then they decided to vacate my body as well. Let me tell you life is tough without eyelashes and nose hair. My eyes water all the time as does my nose. The loss of my eyebrows is just an added annoyance. It's amazing how much eyebrows shape your face. Without eyebrows my face just looks like a blob. I'm really hoping they start growing soon. The below picture shows my eyes with and without make up. Thank god for make up! 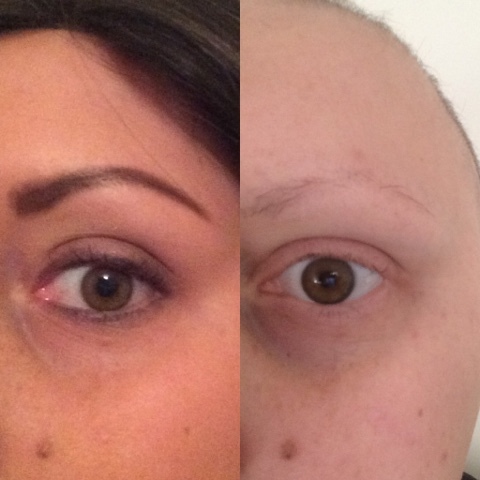 Speaking of make up I recently attended a workshop called Look Good Feel Better at the Sir Robert Ogden Macmillan Centre, which is part of St James's hospital in Leeds. Look Good Feel Better was a great workshop teaching patients how to apply make up. It wasn't exactly a make up lesson at Mac but i still picked up a couple of tips and it was nice to meet a few other people who have cancer. Unfortunately I was still the youngest there by a long way. There was one other lady attending who I got chatting to who was quite young (a lot younger than the rest of the ladies) but she was still ten years older than me. (Lovely to meet her though). There where about 15 ladies attending the workshop and I found I was comfortable enough to whip off my wig after a few minutes, which was nice and stopped me getting moisturiser in my hair. The best thing about the workshop was the free goody bag. If you read my blog regularly you will know I LOVE a freebie! 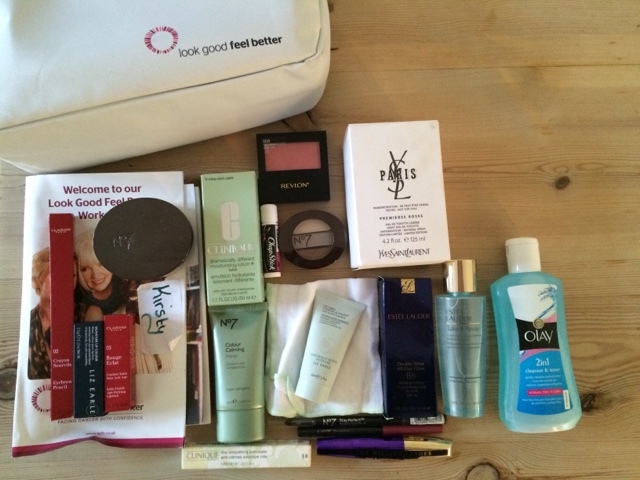 The bag contained loads of free skin care and make up by top brands such as Clarins, Clinique and No 7. The below picture shows all the lovely items I received in my goody bag. 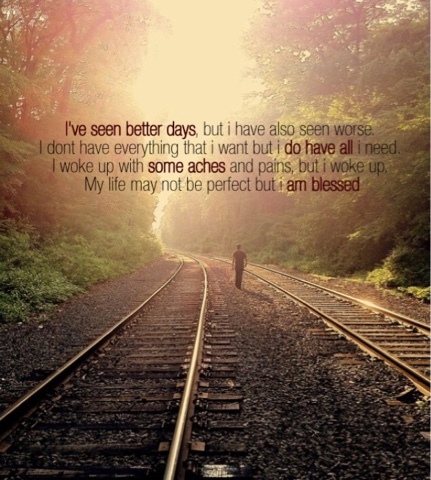 I would definitely recommend attending a Look Good Feel Better session. It's worth it even for the goody bag alone. Go to http://www.lookgoodfeelbetter.co.uk/ to find your nearest workshop and feel free to messege me if you want any more information regarding my experiance. I should also mention that I also attended the 'Headstrong' workshop at the Sir Robert Ogden Macmillan Centre. Unfortunately I didn't feel this workshop was very good. It was very unorganised and started late, which was a bit annoying considering me and my mum had travelled from Silsden and had already been waiting a while. One of the ladies attending who I had been chatting to got quite upset during the workshop. (It is traumatic losing your hair after all) and after a few minutes one of the organisers snapped 'Are you ok now then?' In front of everyone. I found this quite insensitive. We got an information leaflet regarding hair loss, which didn't contain any information that I didn't already know. They said they recommend that everyone try's the cold cap. (You've read my feelings on that above). They said don't shave your hair off before chemo. (Hmm as you can see from my head scarf I've already done that. Oh and I raised three grand for Macmillan in the process but cheers love). They also said don't use anything to promote hair growth. Why can't we use products to promote hair growth if they are inexpensive and make us feel better? 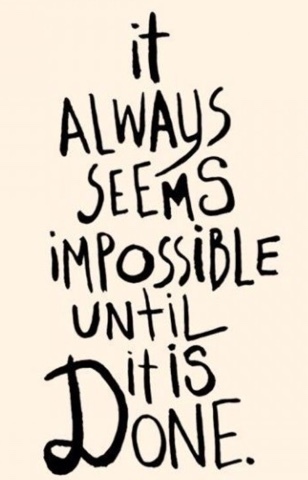 It sometimes good for patients to try and gain back some sort of control. FYI I'm currently using the New shampoo bar and Roots conditioner from Lush. A lot of ladies in my support group have used this and seen good results. They had a lady from Calendar news speaking as she had recently had breast cancer. The organisers where cooing over her but I just couldn't relate to her at all. She showed us lots of pictures of her in her wigs and yes she looked great. But I'm sure she was able to spend a lot of money on her wigs and most of us aren't as lucky. There was another lady who had just had breast cancer who spoke at the end of the session. I found i could relate to her much more and I learnt a lot more listening to her than some Z list celebrity. I hate to write negatively regarding workshops like this but I can't say it was good if it wasn't. Me and mum left before the end of the session. I know some people in other areas have enjoyed the Headstrong workshop so please don't rule it out in other areas based on my opinion. So I really hope my hair starts to grow soon and grow quickly. Please can everyone cross their fingers? In addition my nails don't look great either. 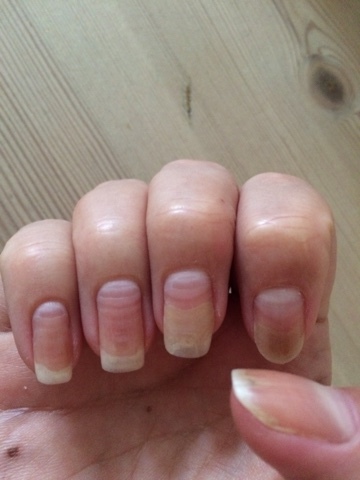 They have ridges and a few look like they have started to come away from the nail bed as you can see from the picture below. (Sorry it's a gross picture). I've been using Onicolife drops for a while now to try and save them. I asked one of my doctors if there is anything I can do to protect them but she just said they would eventually grow out. I have heard dark nail varnish is good to use so I'm going to give that a go along with lots of nail strengthener. So if you could all cross your fingers for my nails too?